W hat is a favela? When I left Washington DC for a filming trip in Rio de Janeiro last week, I was apprehensive. It was my first trip to Latin America’s biggest country. And instead of filming a documentary film on the beaches of Ipanema or Copacabana, I’d be a director/producer on a commercial in some of Rio’s poorest slums (favelas). What would I find? 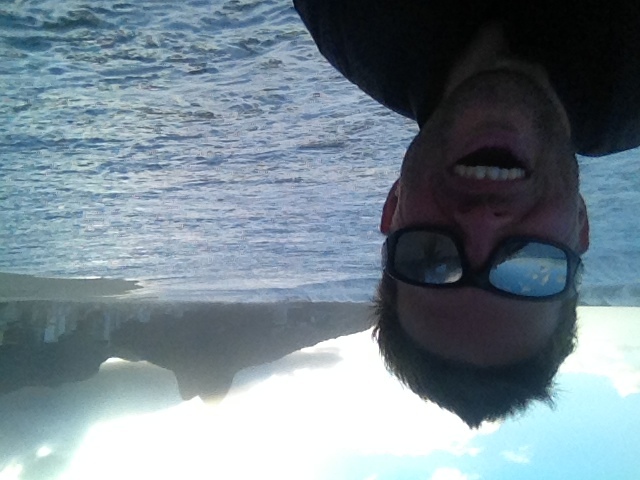 (I took this crazy pic on accident as a wave crashed on me during a walk on Ipanema beach!). To prepare, I read a book entitled “Culture is our Weapon,” by Patrick Neatte and Damian Platt. It chronicles the severe poverty, ubiquitous drug trafficking, and endemic violence of the favelas. It follows the birth of AfroReggae, a transformative nonprofit that gives at-risk youth opportunities to shine, primarily in art and music (samba, hip hop, dancing, drumming, etc). At that point, I spy three teenage boys in shorts and flip flops—and automatic rifles slung over their shoulders. I stayed in Ipanema with an old friend, Neil Breslin, who flew in from Luanda, Angola to be the Unit Producer. Neil runs a firm connecting businesspeople in and out of Angola and speaks perfect Portuguese. He also owns apartments in Rio, so it was a great change of pace to stay at a friend’s place rather than a hotel. 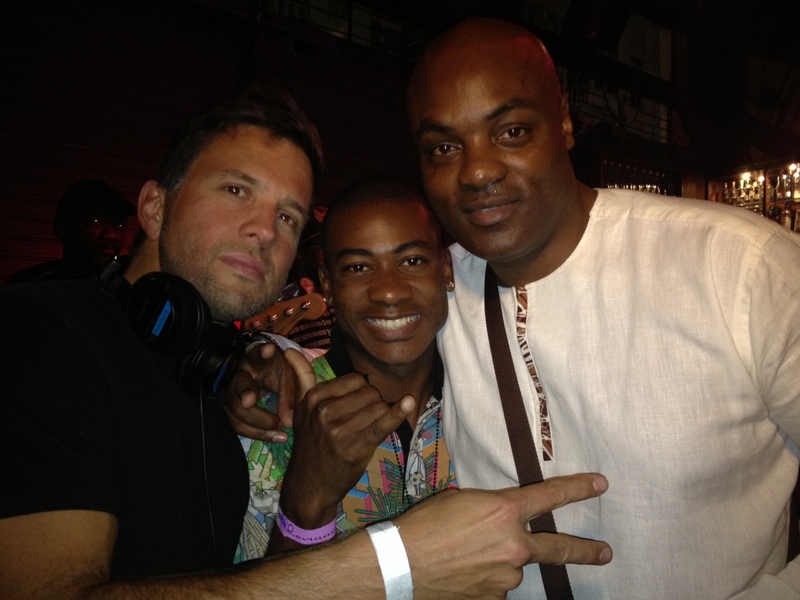 Wrapped AfroReggae shoot at AR21 concert, with AfroSamba lead singer LeCao Magalona and M’zée Fula-Ngenge. Leviano Bar in Lapa neighborhood of Rio de Janeiro. The first morning, we turn inland to a favela called Vigário Geral. As the stunning seaside landscape recedes behind us, Rio is revealed as a sprawling mega-city. Most striking is the trajectory of the favelas, precipitous, straggling, and clinging to hillsides. Our AfroReggae contact drives with us. Then outside Vigário, a local teenage boy meets us. He sits up front and is our ticket in. There’s one way in and out, a desolated and looping off ramp that issues to a main street blocked by two industrial trash containers. Culture is our Weapon describes why favela residents erect such blockades: to keep out overzealous police who have been known to rush in with assault vehicles, purportedly chasing drug traffickers, shoot with impunity, and leave just as quickly. It occurs to me that AfroReggae was established after the massacre of 21 innocents in August 1993, right where I am now. At this point our genial driver, Elton, turns into a spider’s web of narrow alleyways. Homemade super-sized speed bumps pepper the route, so we top out at 5 mph, and Elton executes an exaggerated zigzag for several minutes. We trace a large “U” until we rejoin the main street again. We’re in. At that point, I spy three teenage boys in shorts and flip flops—and automatic rifles slung over their shoulders. This sent a shudder through me. I tell my car mates this is freaking me out. That I’m only used to people in uniforms with guns. Neil counters that we’re actually safer here. The boys won’t harm us. They’re simply keeping the status quo (to protect their drug turf)—whereas if you get robbed in Ipanema or Copacabana, good luck getting justice. 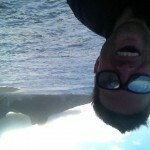 I hadn’t filmed a frame yet and already my worldview was turning upside down. Safer neighborhoods with gun-toting teenagers? Citizen blockades to keep out police? Moreover, I was already seeing parts of Brazil that most Brazilians never see. AfroReggae’s impressive, new four-story community center was built in 2010. It is clean and imposing, with a gaggle of children playing ping pong and foosball in the courtyard. It has all the collective good energy of a YMCA. A massive sculpture of a fist extends from the roof — is it a warning or an expression of pride? The first person I meet is Anderson Sa, AfroReggae’s co-founder and the lead singer of AR21, formerly known as AfroReggae Band. I’d seen Favela Rising, an average documentary about a fascinating subject, where Sa factored prominently. I shot Sa in his recording studio, practicing with his band, and mentoring a younger singer, LeCao Magalona, who headlines the AfroReggae band AfroSamba. Both Sa and Magalona prove to be charismatic guys and very skilled musicians. My client for this job is a private sector company based in Reston, Virginia. They are growing their business overseas, with Brazil one of the priority countries. So they hired me to make a series of spots that will be distributed in Brazil first and foremost. I’m shooting, directing, writing, and producing. I’ve already written the script. The voiceover is in Portuguese. The story needs to resonate with a local audience—which is a change for me. Usually when I travel to film overseas, the resulting film or video is to be viewed by Americans. All this is going through my head at nightfall as I’m getting the last few shots. A plague’s worth of mosquitoes have descended on us from a nearby marsh and are harassing my young on-camera protagonist. The poor boy can’t concentrate on anything else. People are streaming home. Both Sa and Magalona prove to be charismatic guys and very skilled musicians. Since my morning encounter with the rifle-toting teenagers, this is the first evidence that Vigário is an unsafe, unhealthy place. The dozens of people I’ve met are authentic, nice, and all doing their own thing like anybody in any neighborhood. I played soccer with some boys and challenged a young man to a pull-up contest (I lost). I saw (and filmed) a steady stream of talented youth in violin lessons, samba classes, and all manner of dance practices—from ballet for little tots to African dance for seriously legit young adults. AfroReggae has helped create an oasis. 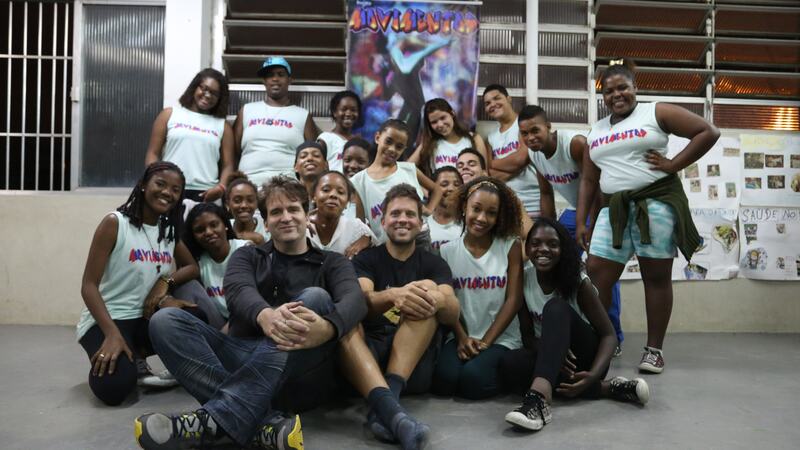 Adany Lima runs the only youth dance troupe, Movimentos, in Cidade de Deos, a favela made famous by a movie of the same name.